This entry was posted in blessings, change, dreams, Eat Pray Love, expectations, giving thanks, gratitude, happiness, relationships, reminders, self-love, support on 7 August 2013 by Martina. I always liked that line, because it hits me. Right there. You know the place: That space between your heart and your throat where you can physically feel your dreams? Yeah, there. But why? 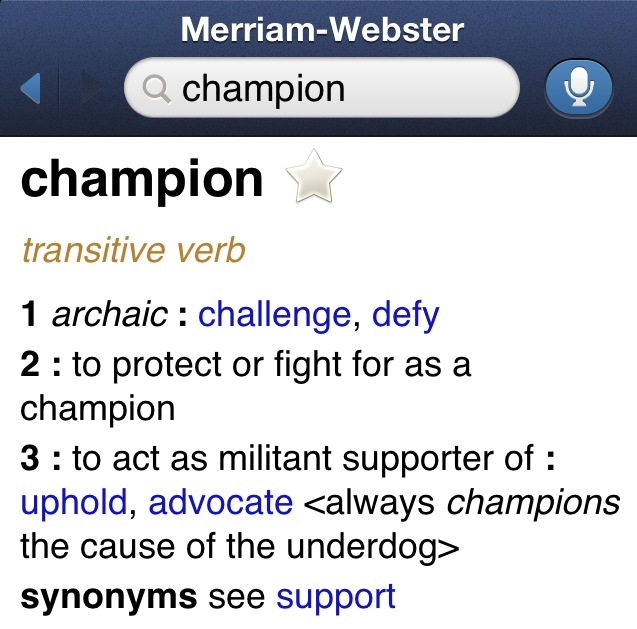 Among other things, a champion is a “warrior or fighter” according to Merriam-Webster. It’s also a verb: to champion means “to protect or fight for.” Let’s explore the latter, because although Javier Bardem uses the noun in the movie, I believe his true intention (or sub-dialogue) was the meaning behind the verb. So let’s go there! When we’re children, we seem to have champions all around us. Sometimes it’s our friends or our parents. Sometimes it’s our teachers or siblings. It’s people who hold us up, hold us accountable, teach and lead us. They are there for us when things get stormy as well as when things are calm and sunny. At face value, champions are the “winners.” Looking deeper, champions are those wonderful individuals who value and respect us as individuals ourselves and who inspire us to be our best self, without asking anything in return. Usually, I would say that all we need is to be our own champion. We do. However, it’s not “all” we need. We need each other, and we each need a champion: That one person in our life, at that one moment, who supports and protects us – who holds us up (or helps us up) when we need it most. It’s the person who makes us laugh or lets us cry – without judgment or expectation – because they know it’s what we need at that moment. It may not be the same person every time. In fact, it probably isn’t. I know who my champions are, even though they’d probably hate that title. 😉 They’re the ones who help me to be who I am every day, by supporting, challenging and encouraging me to show up for myself. Sometimes I forget they’re there though, and then I’m reminded by something seemingly small. Perhaps something so small that they don’t realize that they just donned a cape for me and became my champion in that one moment, and it made all the difference. So, today – it’s a simple reminder to say thank you. Thank you to all the wonderful “champions” out there holding us up, helping us out, laughing with us, and reminding us of who we are, and what we can become. Perhaps, too, it’s a reminder that maybe we’re also wearing a cape for someone and don’t even know it. How wonderful! In the end, I think that’s why that line hits me: Feeling supported and loved is an amazing gift; Feeling championed? That’s love on a whole new level. This entry was posted in blessings, friendship, gift, reason season lifetime, reminders, self; alone, support on 22 February 2010 by Martina. Friend [frend] –noun; 1) a person attached to another by feelings of affection or personal regard; 2) a person who gives assistance; patron; supporter; 3) a person who is on good terms with another; a person who is not hostile. Yikes – “a person who is not hostile.” Really? I don’t think I’d include that in my definition of the word friend. Would you? But it’s a question that is worth asking. How do you define a friend? We have so many friends in our lives that fill myriad roles. There are those that we can call when we want to go out for all-night dancing, and those that we call when we want to chill in a coffee shop or living room for hours discussing the many facets of our lives and the lives of others. There are even those who we simply like to jog or bike with. And then there’s everything in between. There’s a saying I think many of you are familiar with: People come into our lives for a Reason, a Season or a Lifetime. Our friends can pretty much be categorized in this way. Some are always in our lives, others come and go, as they are needed – or we are needed. And still others are passing through our lives like trains in a station. And the best thing is – it’s always perfect. I was recently reminded of the perfection of friendship, and I am filled with gratitude for this loving reminder. In high school and college I referred to my friends as my family. And just like families, relationships grow, change and evolve over time. Nobody is in the same place at the same time, especially as we grow older. When we’re younger, we’re pretty much going through many of the rites of passage together. But as we get older our challenges and experiences become more varied. We may not always understand one another as well as we once did – and that can, at times, feel disheartening. But it’s natural (and perfect) in its own emotional complexity. The beauty of friendship – and having friends with different backgrounds and experiences – is that we almost always have someone to call on for the different events in our life, which is the greatest blessing. And often times, we don’t even need to pick up the phone, because our friends know when to reach out to us when we need them. How great is that!? Now here’s a question: How good of a friend are you to yourself? Do you regularly sit down with yourself and chill in a coffee house, or go biking, or go dancing? What about calling on yourself as your own best friend in times of despair or difficulty, or celebrating with yourself when you’ve achieved something? I know many of us don’t do this on a regular basis. We don’t make “dates” with our Self. I also know many of us don’t know how to do this, because we haven’t necessarily been taught that we can be our own friend. A “friend” is, by definition, “another person” – someone else. But I’d like to challenge that idea. I would like everyone to take a look at themselves today, whether passing by a store window or looking in the mirror, and when you do I’d like you to say hello to your closest confidante, your bosom buddy – your new best friend. Why? Because there are times in our lives when we need to know that we can truly be alone, truly rely on ourselves, and truly be alright just as we are. Friends are a blessing. They are a gift in our lives – one that can be nurtured, cultivated, and treasured. And, if we are blessed, we will always have our friends with us in one way or another. But sometimes life doesn’t go as we planned, and it is also a blessing to know that you can be your own best friend. That you can take a walk alone in the woods, or sit in a movie theatre or coffee shop by yourself, and know that you are with the best company in the world: you. As I mentioned, this week I was reminded of the blessings of friendship, and I am so grateful. 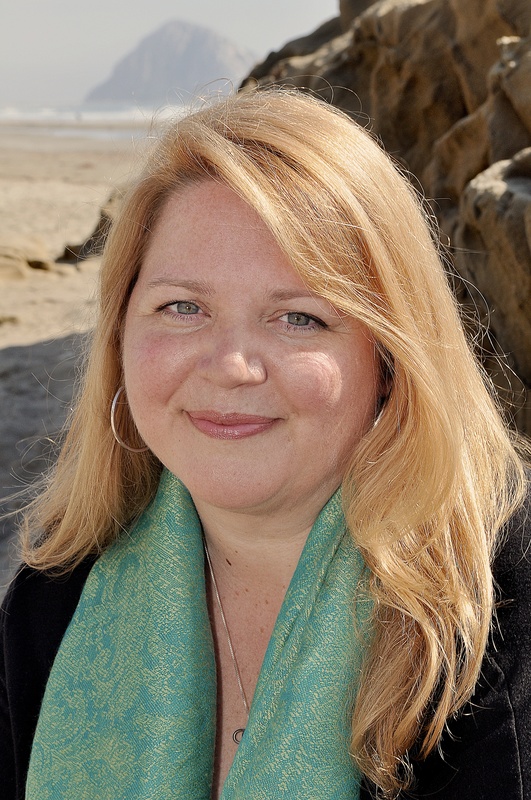 In writing this, I had planned only to discuss the gift of that reminder; but I detoured, and was also reminded of the joy of knowing that I am also my own friend. The peace and comfort that comes with that realization is immeasurable. So, I’ve received two huge reminders this week – and I share them now with you. My wish for you is that you will always be surrounded by your friends, you will always be open to new friendships, and your list of friends always includes You.